In earlier posts, we’ve described how to determine if an injury or illness at the workplace is work-related and recordable, and, if it is, how to complete OSHA’s Form 301, Injury and Illness Incident Report, and OSHA’s Form 300, Log of Work-Related Injuries and Illnesses. In this post, we’ll explain how and when to complete OSHA’s Form 300A: Summary of Work-Related Injuries and Illnesses. What Is Form 300A (the Summary)? Form 300A is a summary of the work-related injuries and illnesses that occurred at the workplace in the previous year and that should have been individually recorded on Form 300: Log of Work-Related Injuries and Illnesses. Do You Have to Post Form 300A? Yes. You must post the Summary (not Form 300, known as the Log) at your workplace by February 1 of the year following the year it covers. For example, if your Form 300A summarizes the workplace accidents that occurred in 2017, it should be posted by February 1, 2018. You must keep the Summary posted until April 30 of the same year. Or, in the terms of our example, until April 30, 2018. Do You Need a Summary for Every Site? Do You Have to Complete and Post Form 300A Even If There Were No Work-Related Injuries and Illnesses? Do You Have to Keep the Form 300A on File? Yes. You must keep the Form 300A, the Summary, on file for at least five years following the year it summarizes. The same is true of Form 300, the Log—you must keep it on file for at least five years. Do You Have to Send Form 300A to OSHA? The answer to this used to be no, but now it may be yes for your establishment. That’s because of the new OSHA online submission requirement. Click the link you just passed to learn more, or go to OSHA’s online reporting website. By the way, our Incident Management System can help you not only create your 300A (plus 300 plus 301), but ALSO submit your incident information online to OSHA. How Do You Complete the Different Sections of Form 300A? To get these figures, find the totals of section M on Form 300 (the Log) and find the totals for columns 1-6. A. Add the total number of employees your establishment paid in all pay periods during the year. Include all employees—full time, part-time, temporary, seasonal, salaries, and hourly. B. Count the number of pay periods your establishment had during the year. Be sure to include any pay periods when you had no employees. C. Divide the number of employees (1) by the number of pay periods (2). D. Round the answer for (3) to the next-highest whole number. “Include hours worked by salaried, hourly, part-time, and seasonal workers, as well as hours worked by other workers subject to day to day supervision by your establishment (e.g., temporary help services workers). Step A: Find the number of full-time employees in your establishment for the year. Step B: Multiply (1) by the number of work hours for a full-time employee in a year (2). Step C: (3), as determined in Step B, above, is the number of full-time hours worked. Step D: Add the number of full-time hours worked (3) to (4), the number of any overtime hours as well as the hours worked by other employees (part-time, temporary, seasonal). Step F: Round (5) to the next-highest whole number (6). According to 1904.32, a company executive must certify the summary. This means the owner, an officer of the corporation, the highest-ranking company official working at the establishment, or his/her supervisor. Note: You can also view instructions for determining these values in a worksheet created by OSHA. Can I Get Some Help with Form 300 and My Other OSHA Recordables and OSHA Forms? The Convergence Incident Management Software will help you complete OSHA Forms 300, 300A, and 301, handle your online electronic submission, and much more. Watch the video below for a quick explanation and overview. 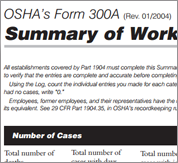 We hope that this article on OSHA’s Form 300A, the Summary of Work-Related Injuries and Illnesses, was helpful. 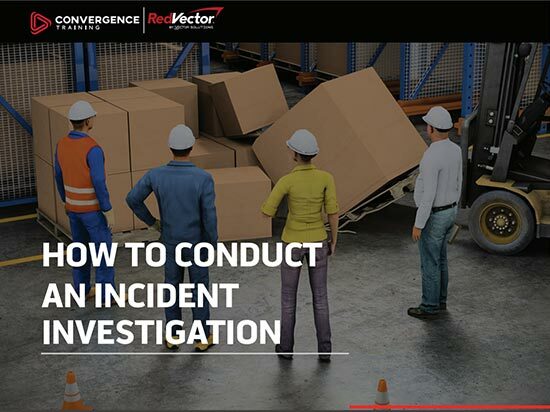 And don’t forget to download the FREE GUIDE TO CONDUCTING AN INCIDENT INVESTIGATION below. Have you seen any discussion about updating the 300 in light of the new reporting criteria 2015? I realize these are two different subjects, when you have to report an incident to OSHA & what you must record on your log, but I’m surprised there is no discussion of changing the recording aspects as well.